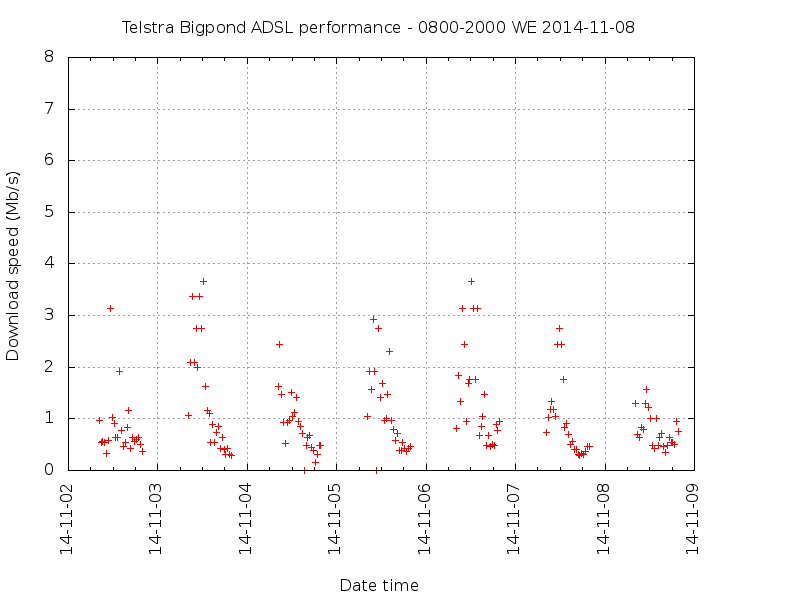 I had cause to document broadband Internet access performance recently, an interesting exercise. When I moved into this house about five years ago, we enjoyed an excellent broadband service delivered on an ADSL1 link of about 800m to the RIM/DSLAM. The downstream rate was capped at 8Mb/s and most of the time, most of that speed was available to the end user. For years I have run a test file transfer every half hour to document access performance, and when asked about recent performance that was an ideal source. I needed to go back to the previous week as last week started with an outage, the RIM batteries seem to have gone flat and Telstra had not been proactive in responding to the condition that left it running on batteries. 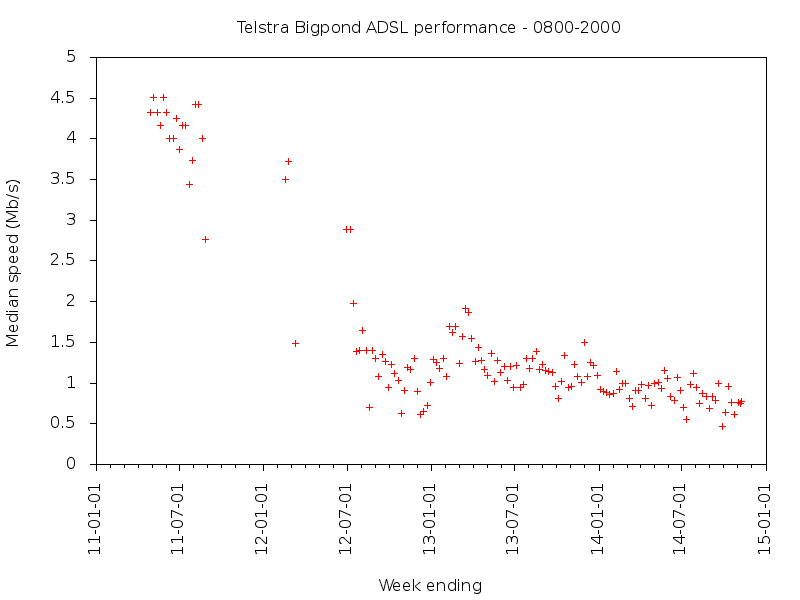 Shortly after moving in, performance collapsed… fairly much at the time that Telstra ran a strong campaign selling T-box (IPTV) and withdrew the Bigpond Movie by post product which was very popular in the area. Marketing of T-box was intense from early 2011, and last movie by post was 30/10/2011 . 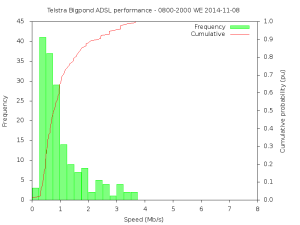 The dramatic fall in median speed shown in the figure above coincided with Telstra’s promotion of T-box and forced migration from Bigpond movies by post. 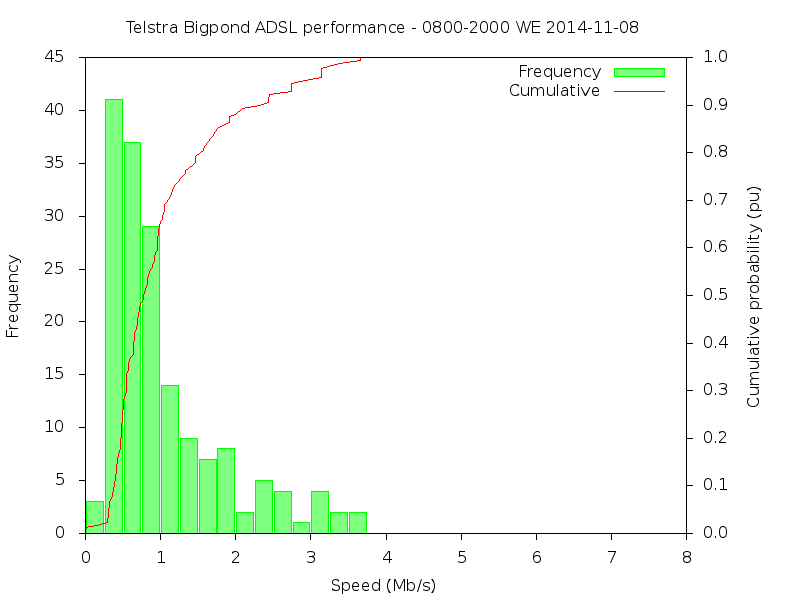 Above, a plot of the transfer speed on the test download over the week. Above is a frequency histogram of the speed, and a cumulative probability curve. Interpreting this graph, 50% of the time, the speed is 0.75Mb/s or better, 50% of the time it is 0.75Mb/s or less. 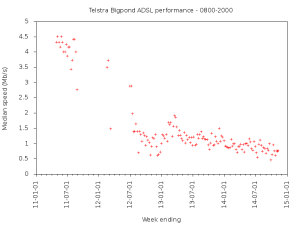 These graphs are generated automatically and the current graphs and archives are at https://owenduffy.net/grabber/bigpond/graph/. 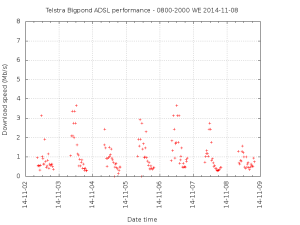 Telstra acknowledged that is poor (TER case SR 1-309635167227) and the only suggestion was to use 4G at higher cost and no service guarantees. When government decided to step in and fix the mess it had made in the way in which it deregulated and privatised the dominant carrier, it decided that the way ahead was to become a carriage service provider, it would create a government owned National Broadband Network. SInce government was to become a carrier, they quietly dismantled consumer protection and diverted attention to technology, whether fibre was better than copper. The new government recognised many of the failings of the previous government’s architecture and implementation, and some might regard they were elected with a mandate to fix the problem. Well, NBN certainly took down all of the schedules and promises about delivery, because like service levels, they are just a rod for their own backs, and government’s at the next election. So, Telstra doesn’t have a business case to meet existing and growing demand on it services (including demand whipped up by their own marketing) because there is no clear lifetime to existing network infrastructure. This is a problem of government’s making. Over decades governments have tinkered with regulation of the telecommunications industry, and without much foresight, without much competence we have been actively steered to the current situation. Governments principal role should be to set service levels, and a consumer protection framework that ensures consumers have access to services reasonable prices and that they perform to an adequate standard. Whilst government is a carrier (as it is now in owning the National Broadband Network) it has a conflict of interest, and we can expect that consumer protection will not be a priority… which is exactly what has happened. It has suited governments to hijack the service issue and talk about infrastructure media (fibre vs copper) as if selecting a ubiquitous medium fixes service issues. My own case where congestion on the fibre backhaul is the cause of bad service highlights their naivety and that of the electors who were duped by political messages. We brace for shool holidays which start shortly. Experience has shown that performance will be worse than usual for the next few months. Beyond that, the current government solved the problems of meeting NBN rollout targets by not publishing any, so we are entirely in the dark. Telstra won’t invest in the current service as, in the words of their consultant, “NBN is looming”.